The Cityscenes™ line of Spectrum® building kits offers a dramatic skyline for your diesel- or steam-era railroad. 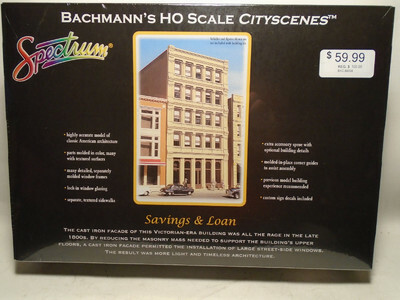 Two skyscrapers, a hotel, department store, variety store, bank, and bus station are all richly detailed and accurately modeled for amazing realism. Now your railroad can reach to the sky with Bachmann’s Cityscenes™. overhangs, or ornamentation (if included with buildings). Previous modeling experience recommended.